After the previous day’s success with the first core, the team was eager to collect as many cores as possible while the weather remained calm. 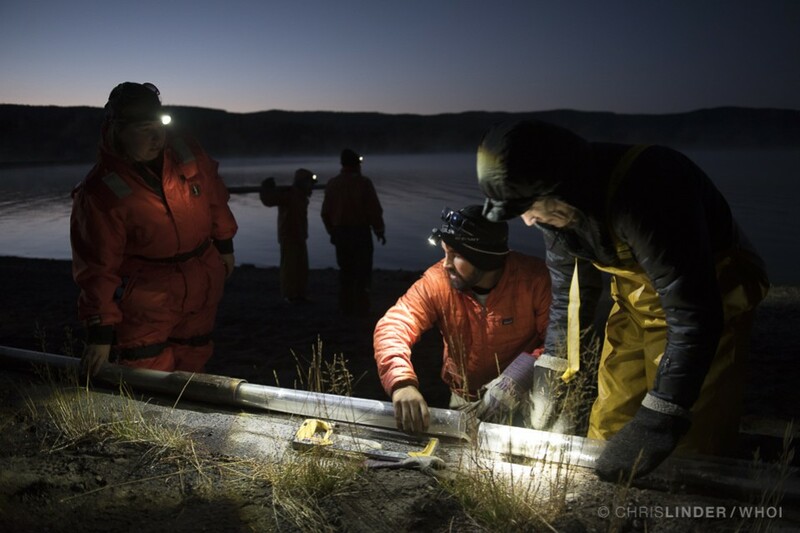 With that in mind, the group was already underway on the coring rig shortly after sunrise. 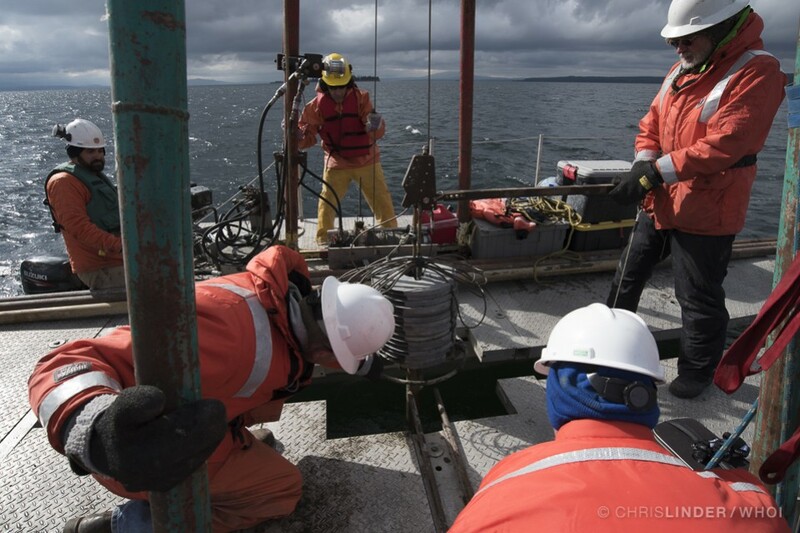 Click through the slideshow below to see what it’s like to work on the coring platform, which has no shelter or facilities. 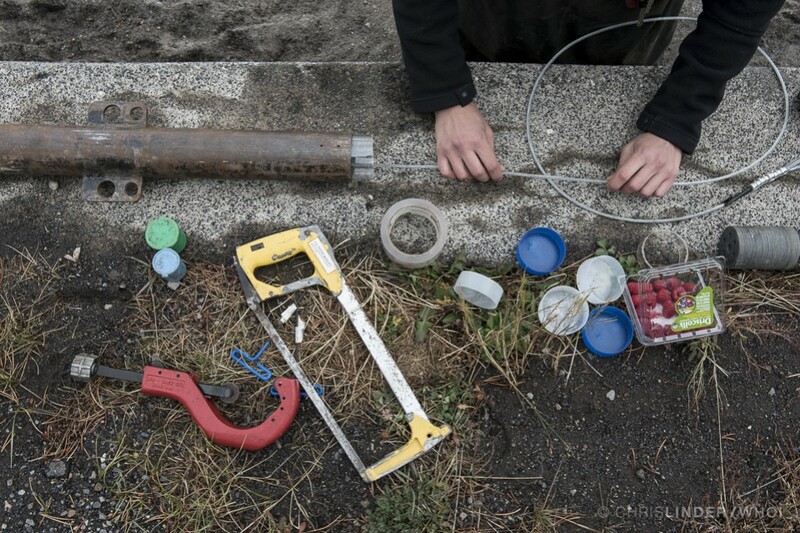 Over the next few days, the coring team collected eight cores including one from each of the six sites. 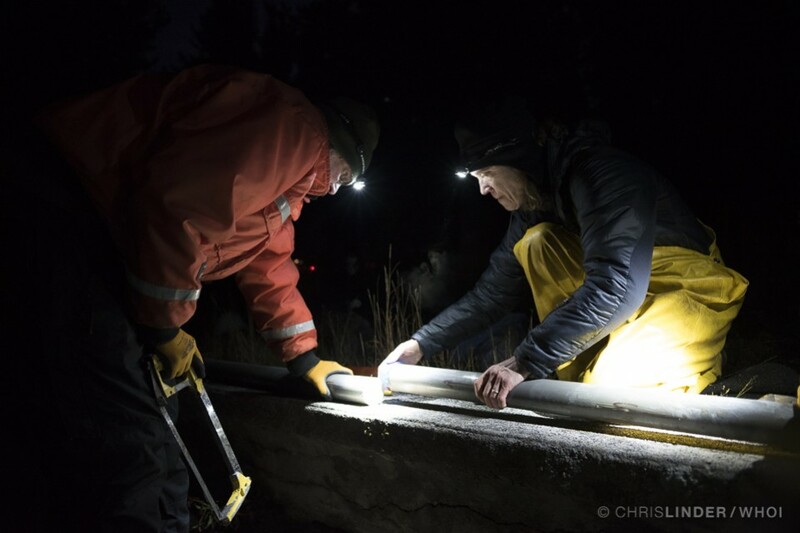 Several cores were 40 feet in length (previous cores from the Lake maxed out at ~28 feet), and one of the cores may have penetrated into glacial flour, meaning it may provide a complete record back to the last glaciation. Many of the cores contained significant amounts of gas, probably carbon dioxide, especially the Stevenson Island core. The team is thrilled with the coring effort and eager to see what stories the cores will reveal. 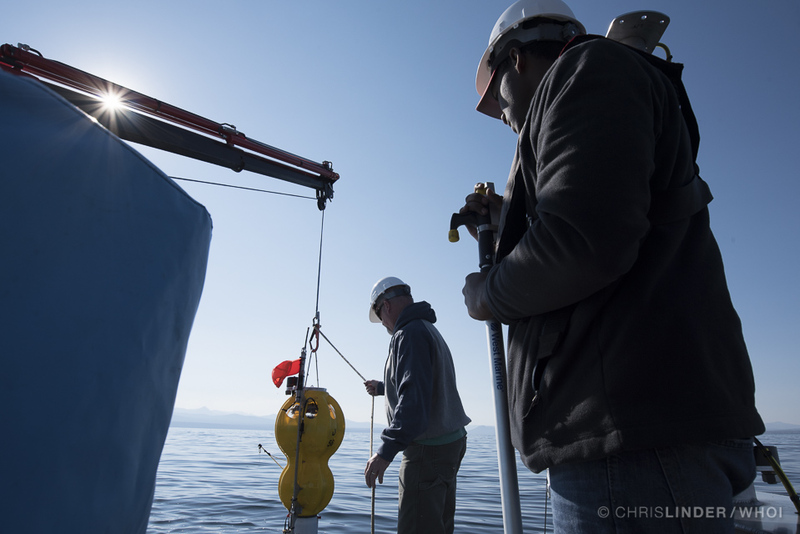 Photos by Chris Linder, WHOI. Work was completed under an authorized Yellowstone Research Permit. 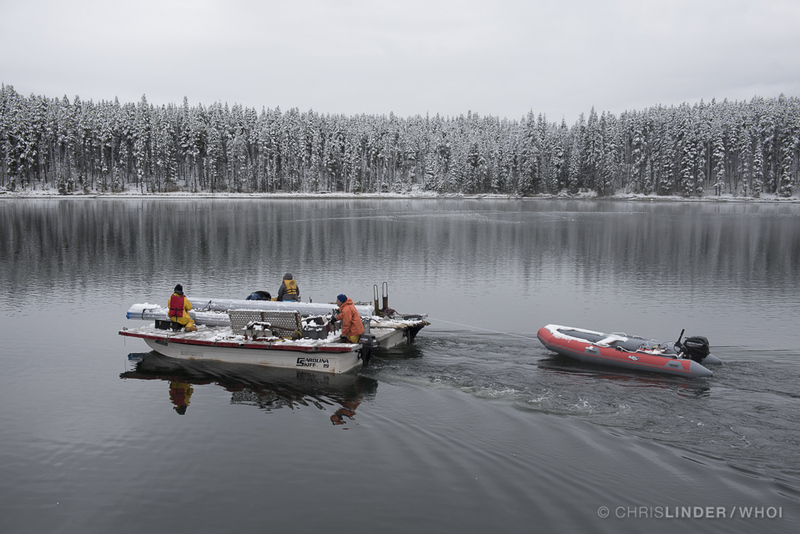 A cold gray dawn greeted the team, and the glassy lake surface promised a good day ahead. Work was completed under an authorized Yellowstone Research Permit. 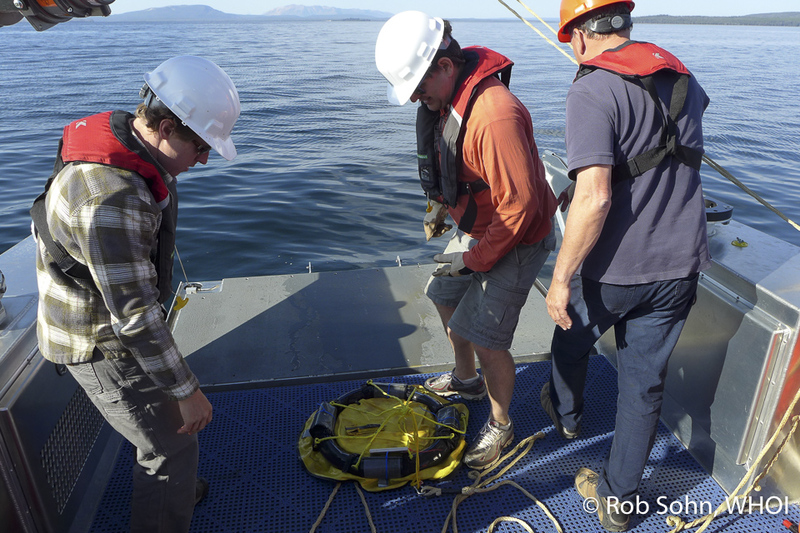 Rob Sohn helps to stabilize the core before deployment at the first site, within sight of the historic Lake Hotel. Work was completed under an authorized Yellowstone Research Permit. Pat Shanks (furthest right) guides the core assembly so that it fits through the 'moon pool' in between the skiffs. The pile of weights is what does the work of pushing the core barrel into the lake floor. Work was completed under an authorized Yellowstone Research Permit. 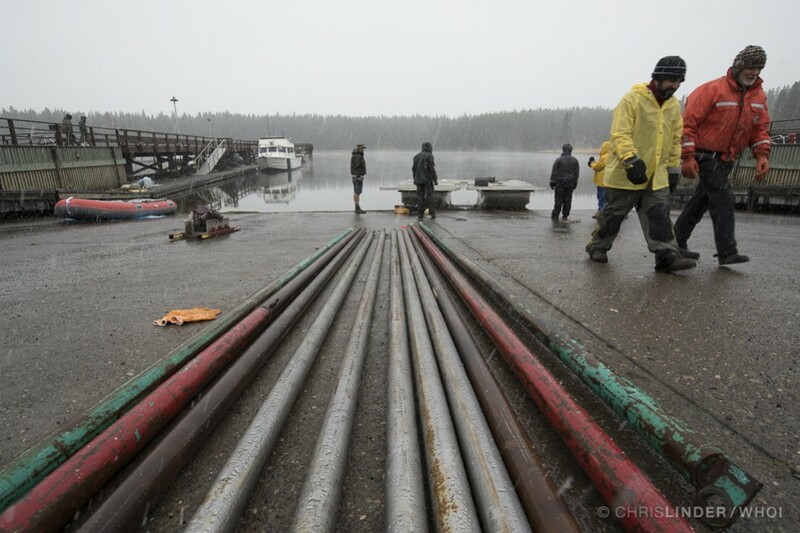 The gray morning gave way to a broken sky with lots of foreboding clouds, but the team made quick work at the Lake Hotel site, collecting two cores in two hours. Work was completed under an authorized Yellowstone Research Permit. 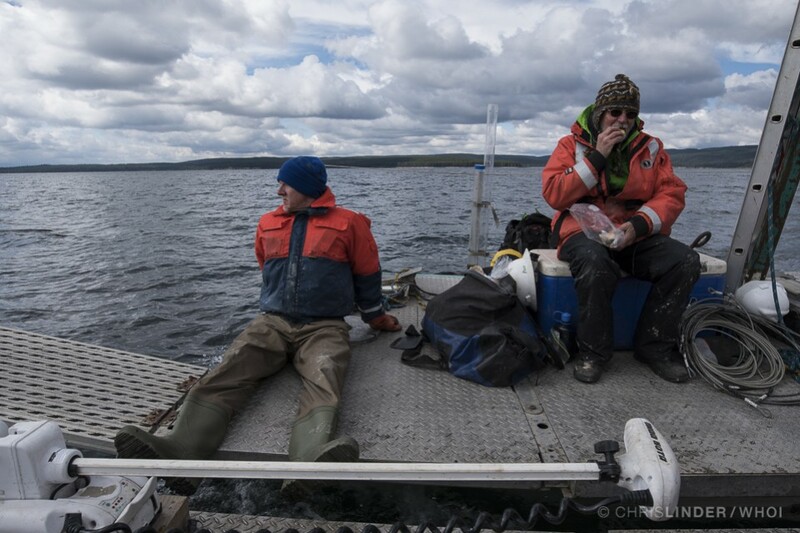 Rob Sohn (left) keeps an eye on the weather while Pat Shanks (right) grabs a quick bite as the rig motors to the second site of the day. Work was completed under an authorized Yellowstone Research Permit. Coring is muddy work. Work was completed under an authorized Yellowstone Research Permit. Processed and ready to go: one of the day's three successful cores is ready for transport to the lab. Work was completed under an authorized Yellowstone Research Permit. Pat Shanks extracts pore fluid samples from the cores. The sediments are porous, and the fluids in the pores can provide important information about how the hydrothermal fluids interact with the sediment layer on their way into the lake. Work was completed under an authorized Yellowstone Research Permit. After spending the morning finishing the construction of the coring vessel, the team was eager to get out and collect their first core. Normally in the afternoon you can expect some winds to build over the lake, but today to our surprise it was flat calm. 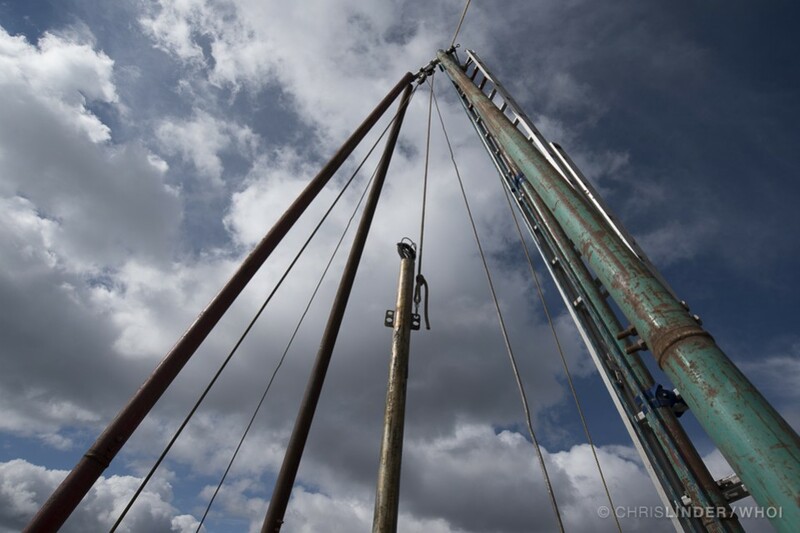 The coring team took advantage of the lull in the weather and headed to their first site of six. 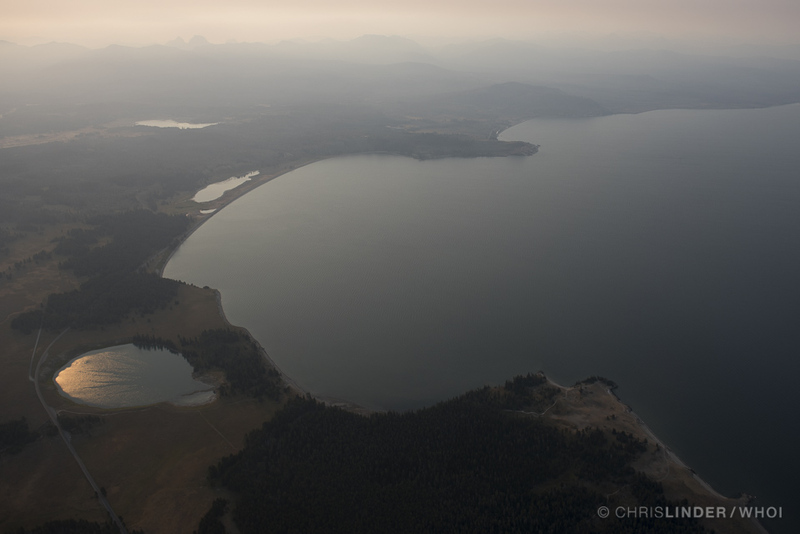 Even though all of the sites are within Yellowstone Lake, each one is in a different geologic area, including a deep ‘graben’ (a ditch in between two faults), a large hydrothermal explosion crater, the deep, hydrothermally active hole east of Stevenson Island, and areas of landslide deposits. 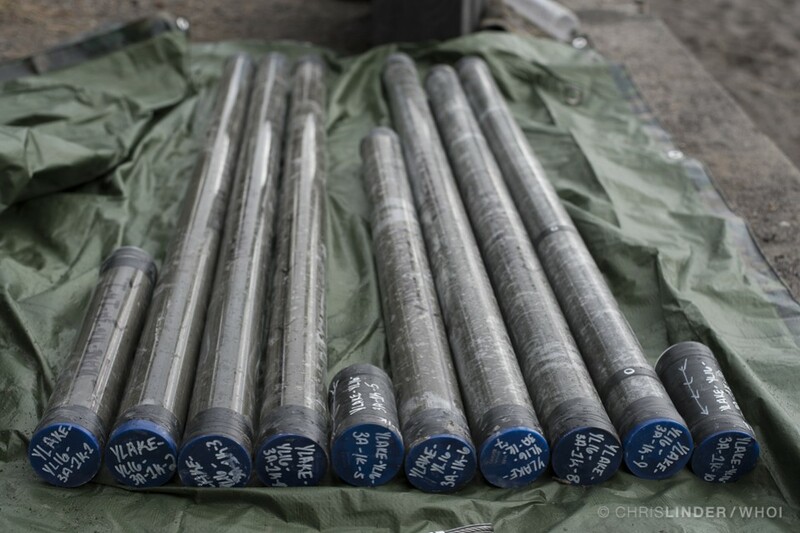 The cores from these different sites will give the team an unprecedented look at the post-glacial geological history of the lake region, including the processes by which large hydrothermal explosion craters were formed. You couldn't ask for a nicer September afternoon on Yellowstone Lake. The coring vessel motors to site number one. Work was completed under an authorized Yellowstone Research Permit. 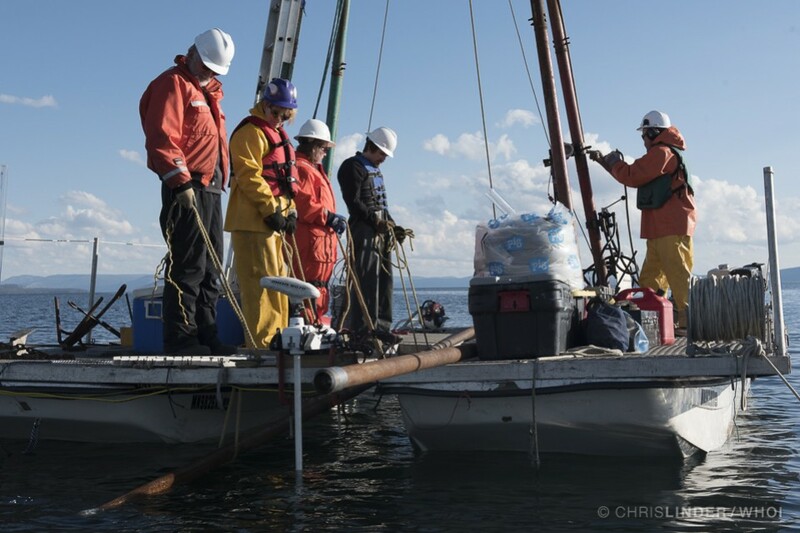 The coring team (from left, Pat Shanks, Sheri Fritz, Sabrina Brown, and Chris Schiller) uses lines to support the long coring tube while Mark Shapley (right) prepares to hoist it upright with a winch. Work was completed under an authorized Yellowstone Research Permit. Once the core barrel is upright, it is loaded with weights and lowered into the bottom of the lake. Work was completed under an authorized Yellowstone Research Permit. To bring the core back on deck, the procedure is repeated—but this time in reverse order. 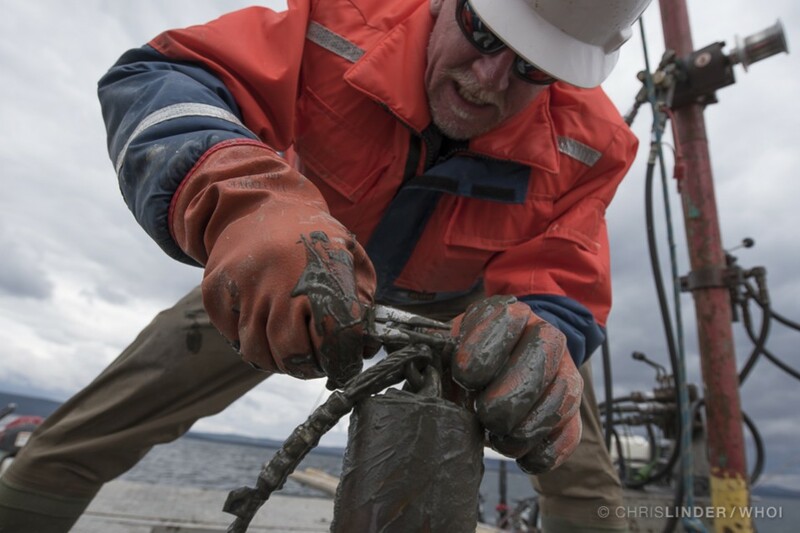 It takes all six people working on the coring vessel to move the long core barrels into position. Work was completed under an authorized Yellowstone Research Permit. After successfully collecting the first core, the team raced the setting sun back to Gull Point. There were still hours of work remaining—the team had to safely remove the precious sediment cores from the barrels and store them for future analysis. Ryan O'Grady takes notes while Sabrina Brown measures a short piece of core. Work was completed under an authorized Yellowstone Research Permit. 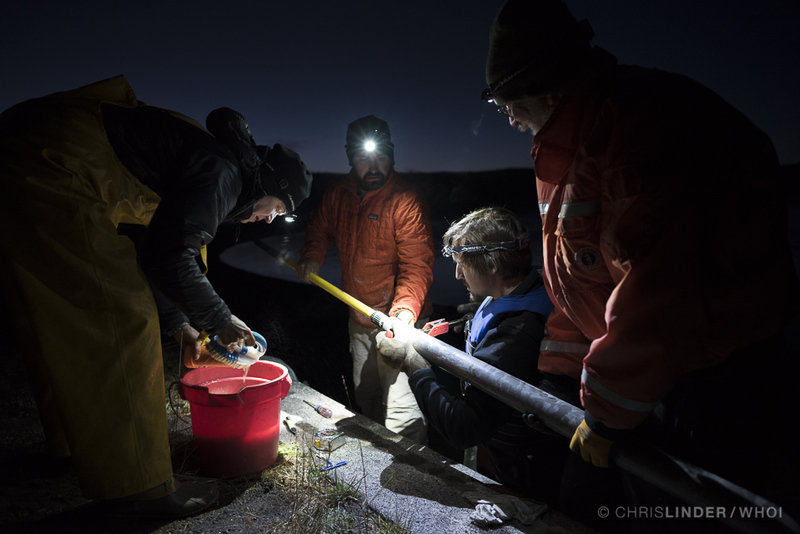 The team works by headlamp to extract and label the cores. Work was completed under an authorized Yellowstone Research Permit. The cores are cut into manageable sizes for transportation back to the National Lacustrine Core Facility in Minnesota, where they will be stored for future analysis. Work was completed under an authorized Yellowstone Research Permit. Pat Shanks (left) and Sheri Fritz cap a piece of the deep graben core. By the time they finished, it was completely dark. Work was completed under an authorized Yellowstone Research Permit. 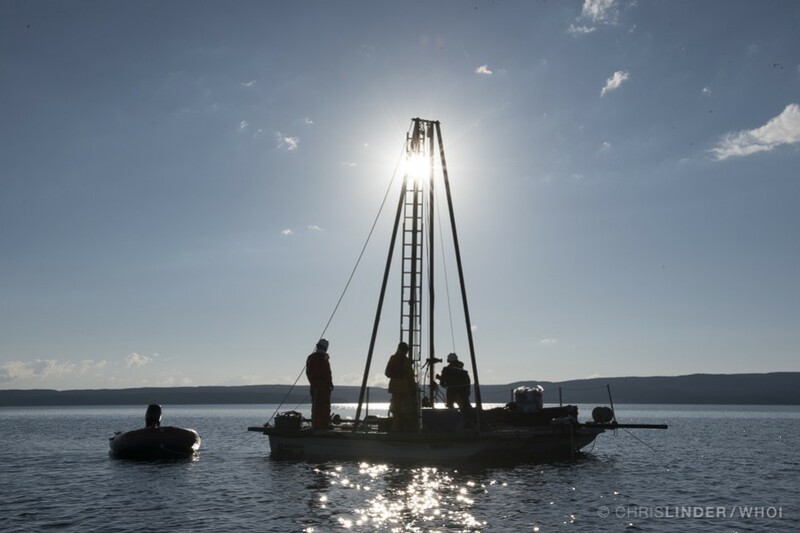 The focus of the September HD-YLAKE fieldwork is to understand the deep history of Yellowstone Lake’s hydrothermal system by studying the sediment, or mud, that has settled on the bottom of Yellowstone Lake. The deeper you dig into the sediment, the farther back into history you can go. With these cores, some of which are nearly 40 feet in length, the HD-YLAKE team can get a better understanding of how the lake’s hydrothermal system has responded to geological events, including earthquakes, volcanic activity, and changing climate — up to 15,000 years ago when glaciers were beginning to recede from Yellowstone. The HD-YLAKE coring science team includes PIs Lisa Morgan (USGS), Pat Shanks (USGS), Sheri Fritz (U Nebraska), Cathy Whitlock (Montana State U), and Rob Sohn (WHOI), as well as graduate students Chris Schiller (Montana State U) and Sabrina Brown (U Nebraska). Retired high school teacher Michael Baker, and visiting scientist Dan Conley (Lund U, Sweden) volunteered their time and energy to the fieldwork effort. Ryan O’Grady and Mark Shapley from the LacCore National Lacustrine Core Facility at the University of Minnesota specialize in taking deep cores from lakes all around the world. 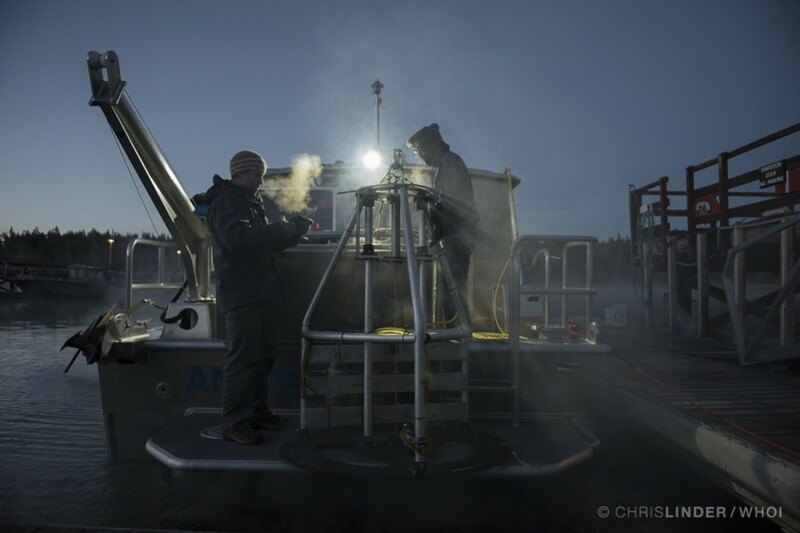 Read the captions below to see how they worked with the HD-YLAKE science team to assemble this one-of-a-kind coring vessel… in a snowstorm. 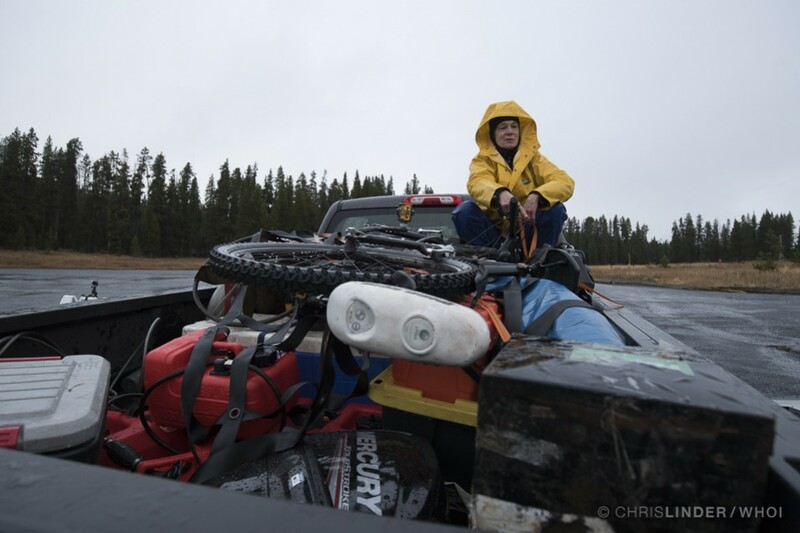 Dr. Sheri Fritz from the University of Nebraska helps unload a mountain of equipment in the back of a pickup truck. 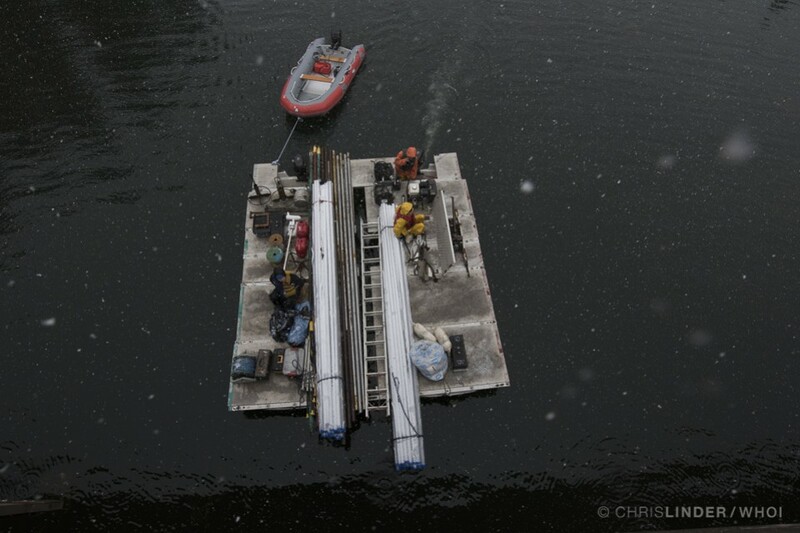 The LacCore team drove all of the supplies to build the coring platform from Minnesota, including two Carolina skiffs stacked in a boat trailer. Work was completed under an authorized Yellowstone Research Permit. 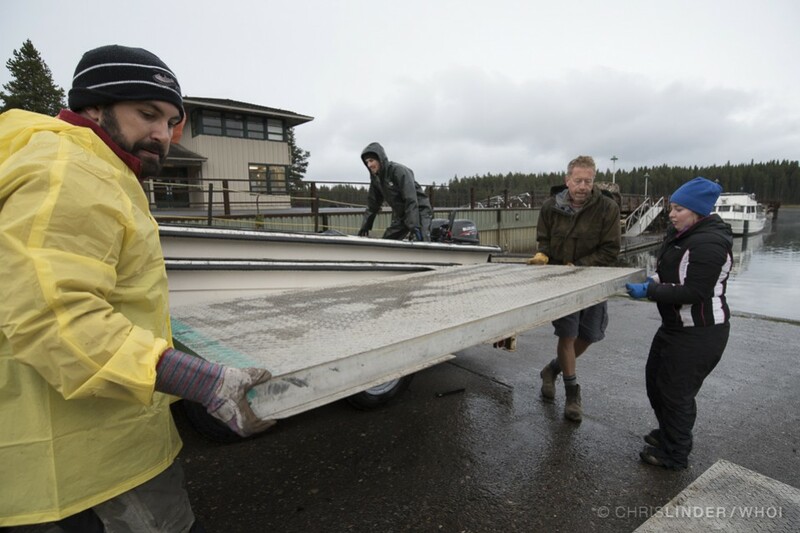 From left, Ryan O'Grady (left), Chris Schiller, Michael Baker, and Sabrina Brown unload the metal platforms that will form the decking of the coring vessel. Work was completed under an authorized Yellowstone Research Permit. The long core barrels point towards the coring vessel, which now has the decking assembled, joining the two skiffs. Work was completed under an authorized Yellowstone Research Permit. 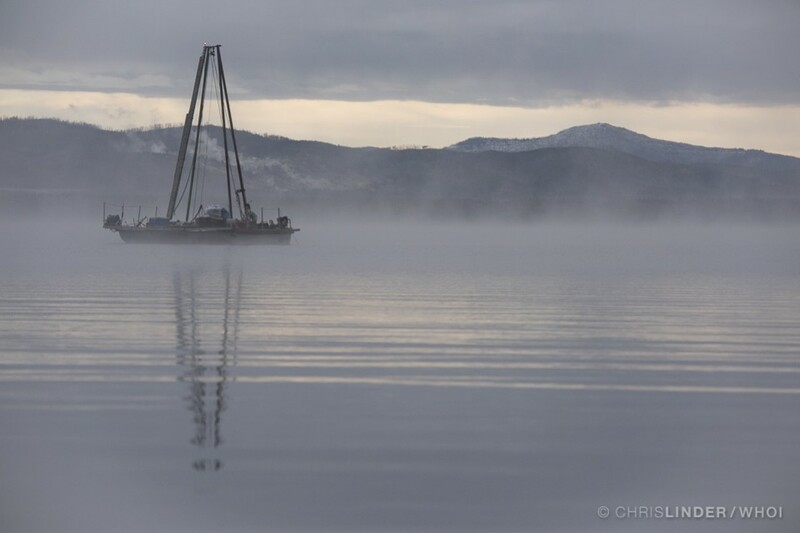 After working for hours in freezing rain and wet snow, the coring vessel is finally seaworthy. Since the vessel has to pass under the Bridge Bay marina bridge, the team has to finish the assembly of the tall coring frame on the shores of Gull Point, just outside the marina. Work was completed under an authorized Yellowstone Research Permit. As the storm intensified on Monday afternoon, the team aborted the assembly. In the morning, a fresh blanket of snow covered the park, and calm waters allowed the team to pilot the vessel back out to Gull Point. Work was completed under an authorized Yellowstone Research Permit. 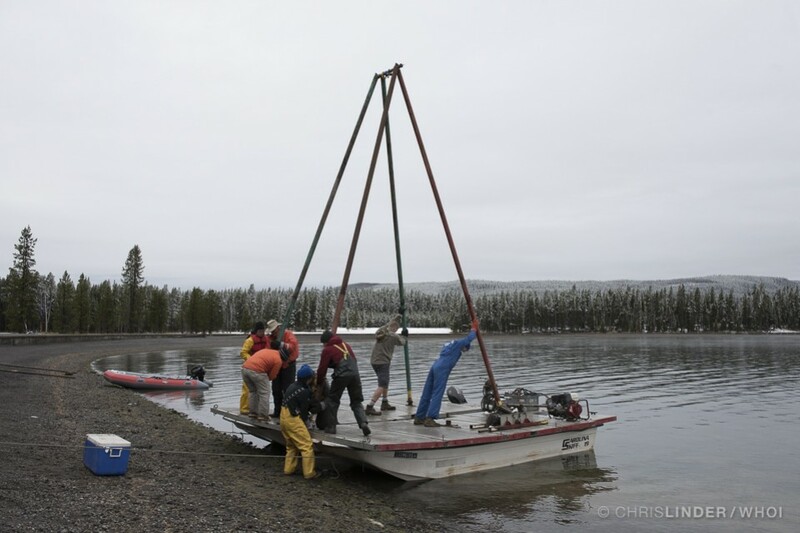 It took eight people to push the tall metal A-frame into place on the coring vessel. Work was completed under an authorized Yellowstone Research Permit. 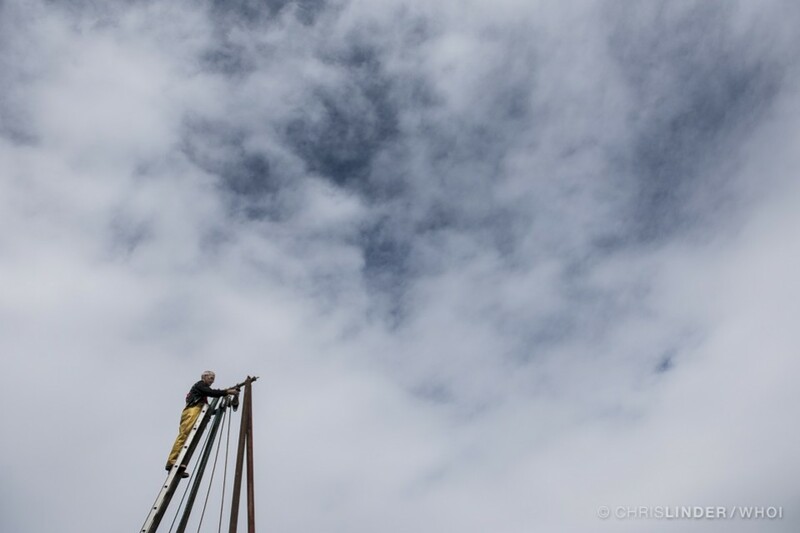 Mark Shapley climbs to the top of the A-frame to attach a series of blocks, which will be used to lower the core barrels to the lake bottom, and hoist them up when they are full of sediment. As the day wore on, the gray skies cleared, the snow melted, and the team set out to collect their first core… Work was completed under an authorized Yellowstone Research Permit. Chris Schiller assembles the core barrels on the sandy shore of Gull Point. 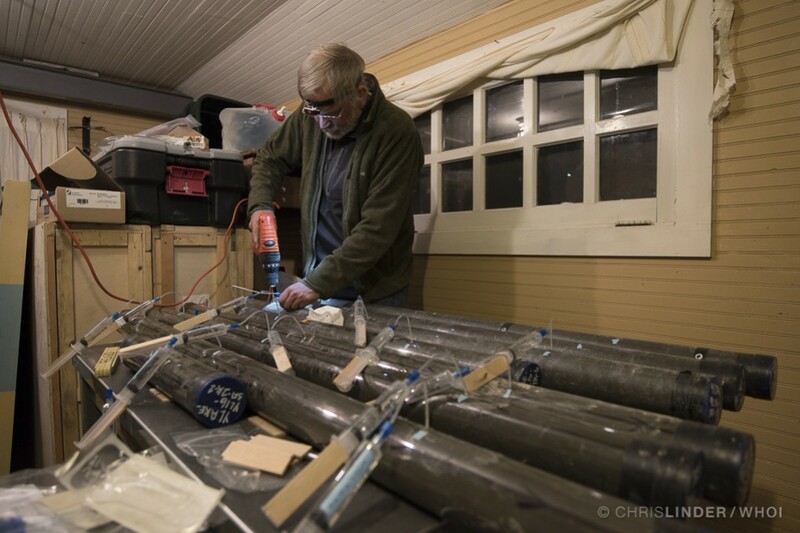 Clear plastic tubes are inserted into the metal tubes—these will hold the core of lake sediment and keep it intact for future analysis. Work was completed under an authorized Yellowstone Research Permit. Yellowstone National Park is world renowned for its geothermal activity. Hot springs, mud pots, and geysers bubble and froth, sending plumes of steam up into the air on cool mornings. 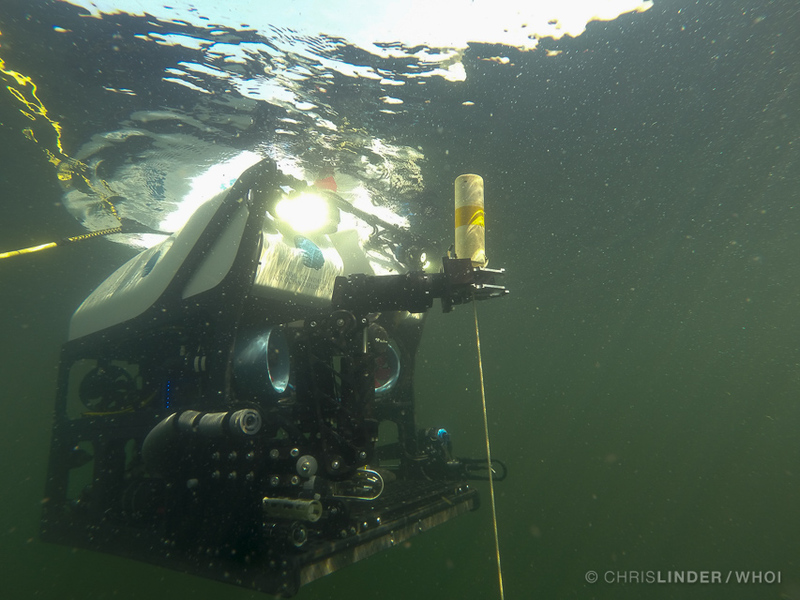 Scientists from the HD-YLAKE project are interested in measuring the flow of heat from the lake floor, and how it varies with time at different locations. 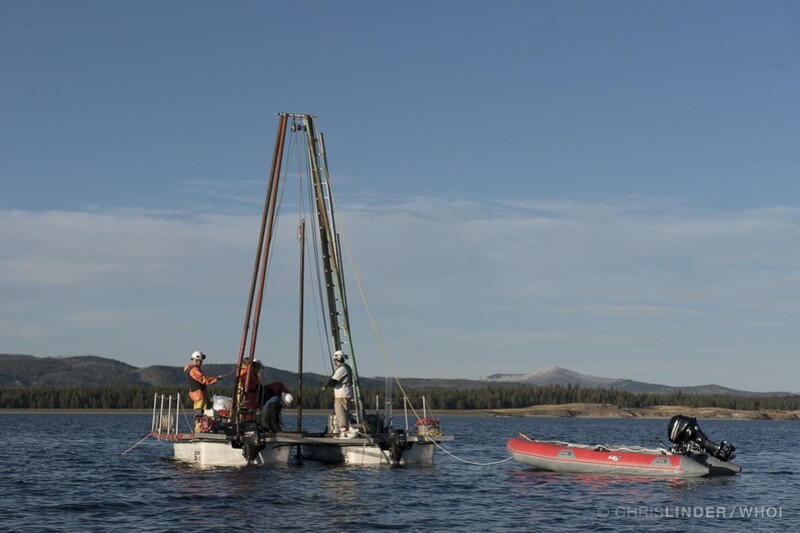 Heat flow is measured by determining how fast the temperature increases with depth below the lake floor, and specialized tools are required when you are working in a lake that is more than 400 ft deep. The heat we are measuring comes directly from the magma chamber(s) that underly the Yellowstone caldera, and at our focus site we measured values greater than 100 W/m^2, which is more than one thousand times the average value for sites in North America. Photos by Chris Linder and Rob Sohn, WHOI. Work was completed under an authorized Yellowstone Research Permit. Heat flow is happening all around us. 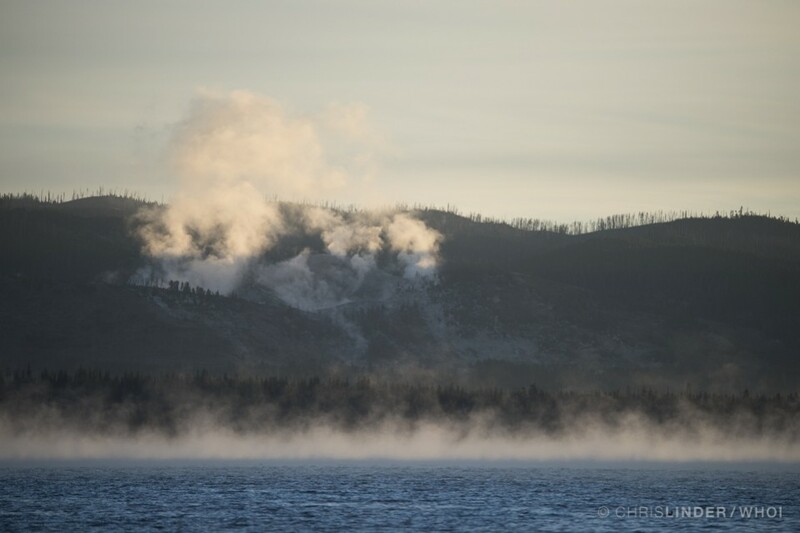 In Yellowstone, it's easily visible on a cool morning as fog forms on the warmer (relative to the air) lake surface and geothermal steam from Sulphur Hills condenses as it rises into the air. Work was completed under an authorized Yellowstone Research Permit. Rob Harris from Oregon State University (middle of this photo, red shirt) is the lead scientist for the heat flow measurements. 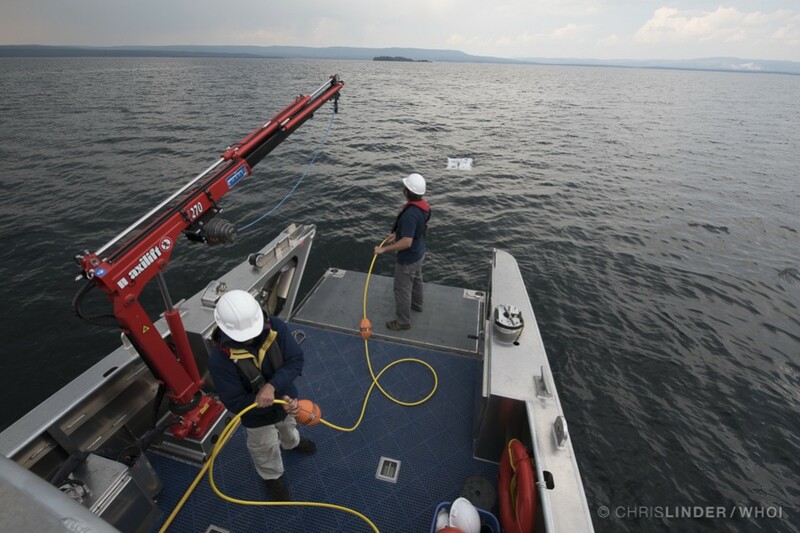 In August, Dr. Harris worked aboard the Annie to deploy a variety of instruments to measure heat flow on the bottom of Yellowstone Lake. Here he prepares a thermal blanket for deployment. Work was completed under an authorized Yellowstone Research Permit. 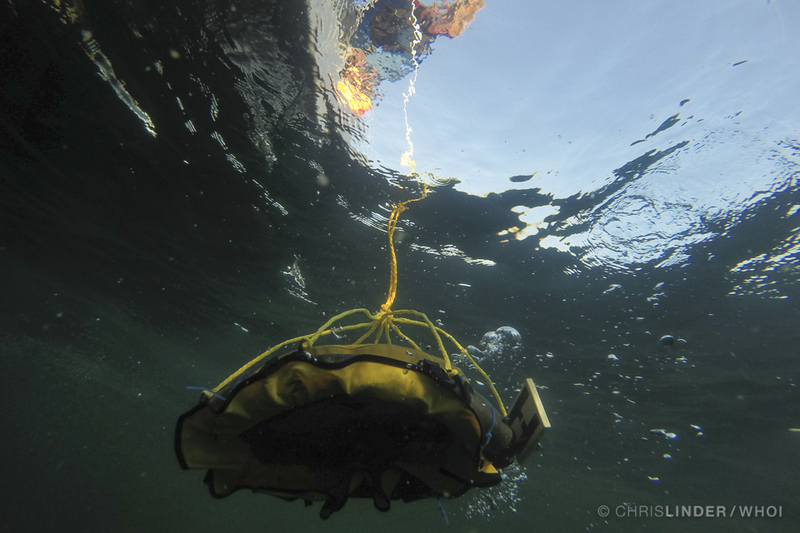 In August, the team used 'the chandelier', an instrument that is lowered off the Annie and has a long temperature probe that measures the heat flow through the lake sediments. Work was completed under an authorized Yellowstone Research Permit. 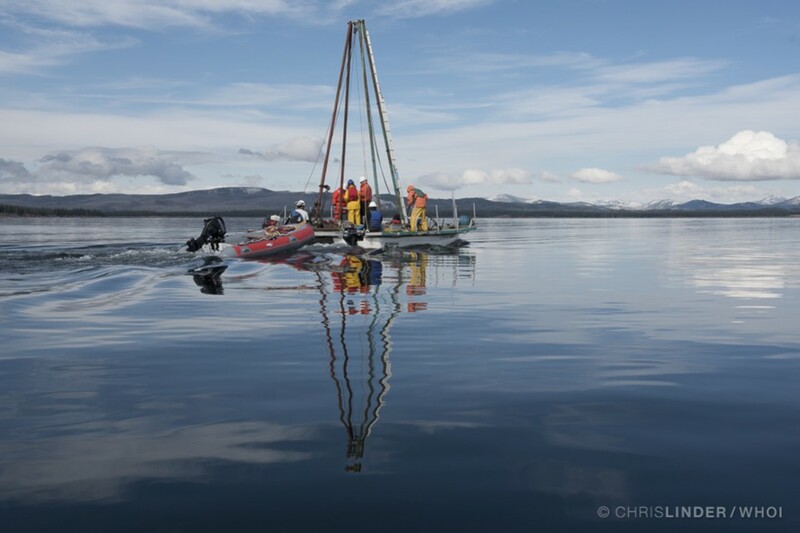 The team also used the remotely operated vehicle Yogi to carefully place heat sensors on the lake bed. The team will retrieve them, and their precious data, next summer. Work was completed under an authorized Yellowstone Research Permit. 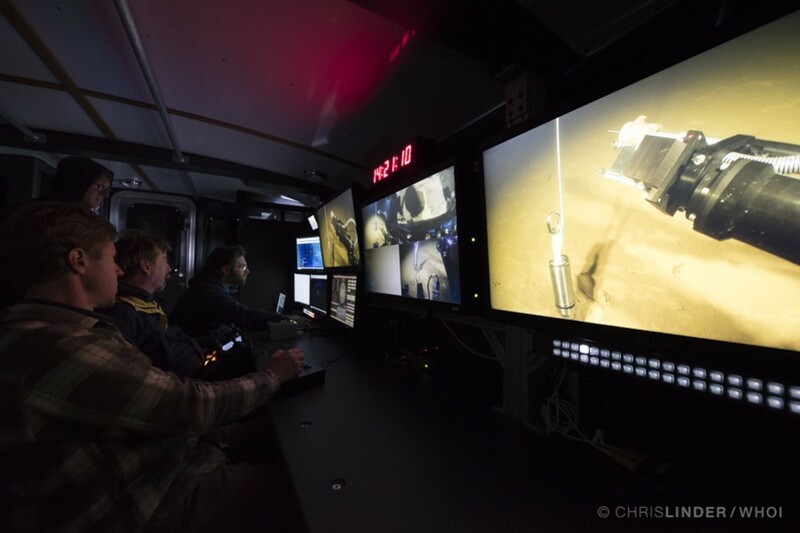 The team huddles around monitors in Annie's control room, watching a live video feed of Yogi's robotic arm precisely placing a heat flow probe into the lake bed. Yogi deployed 4 probes that will measure heat flow continuously for the next year. Work was completed under an authorized Yellowstone Research Permit. A monitor shows a closeup of the probe. The line attached to the probe links it with a float, which makes it easier for the team to find next summer. Work was completed under an authorized Yellowstone Research Permit. Todd Gregory lowers 'the chandelier' over the side. 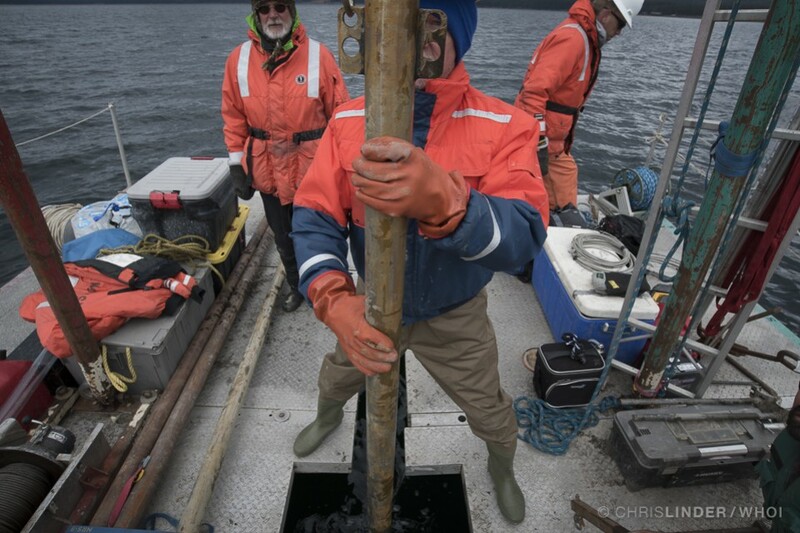 Once on the bottom, a probe with 6 thermometers at evenly spaced depth intervals is inserted into the sediment. By measuring the temperature change with depth the team can then compute how much heat is flowing into the lake from beneath the surface. Work was completed under an authorized Yellowstone Research Permit. The team lowers a thermal blanket over the side. The thermal blankets are simpler, but less accurate, instruments to use compared to the probes that must be inserted into the sediment. The instruments sit on the lake floor, and have a thermometer above and below a closed cell foam 'blanket'. 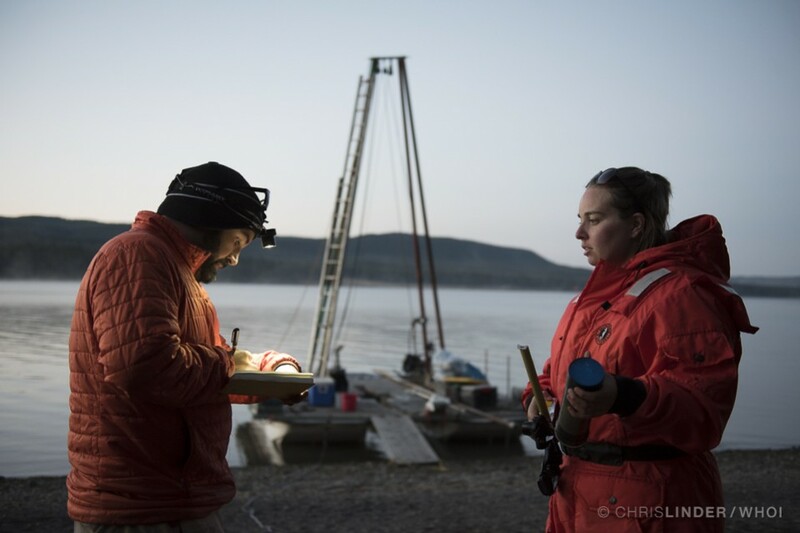 The temperature difference across the blanket allows the team to estimate how much heat is flowing into the lake from the top of the sediment layer. Work was completed under an authorized Yellowstone Research Permit. 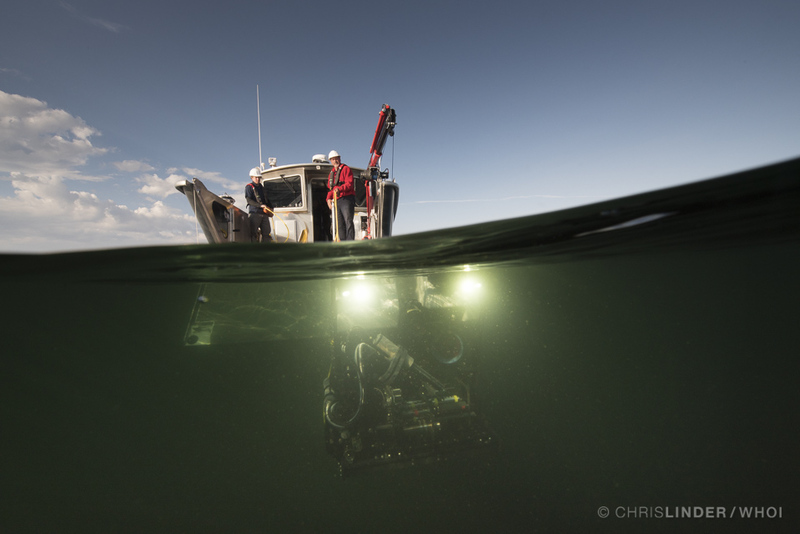 This August, the newly built Yogi remotely operated vehicle (named for the inquisitive picnic basket-stealing cartoon bear that inhabited “Jellystone”), made its first dive into Yellowstone Lake. 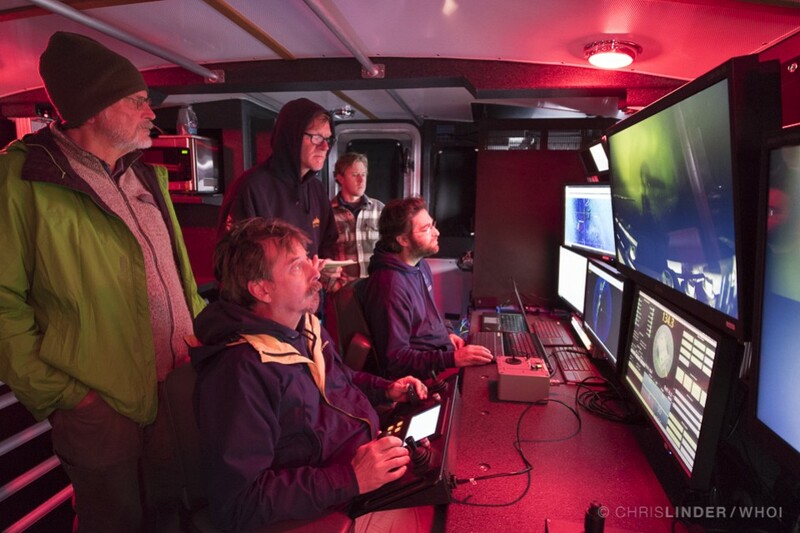 Designed and built by the Global Foundation for Ocean Exploration (GFOE) using technologies developed based on years of exploring the ocean depths, the Yogi robotic vehicle is a key tool in the HD-YLAKE project. 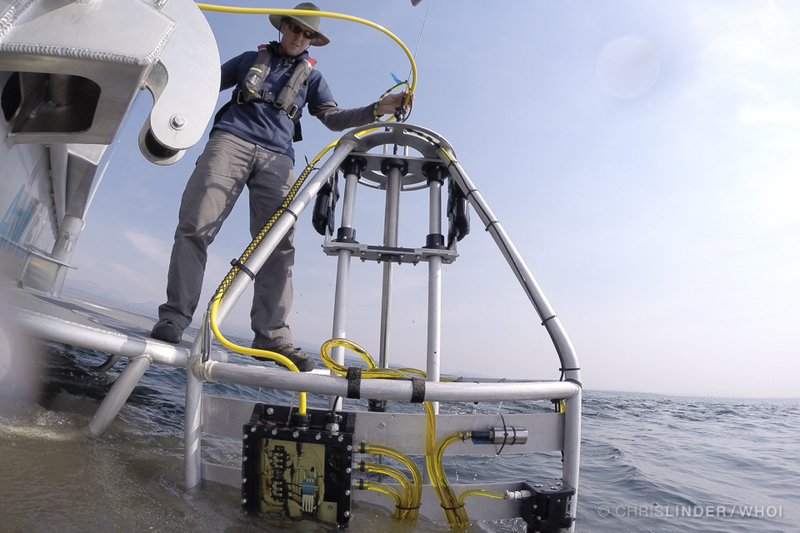 Yogi gives scientists an unprecedented view of the lakebed through its high definition video cameras, plus the ability to retrieve samples and deploy instruments using a fully articulated manipulator arm. 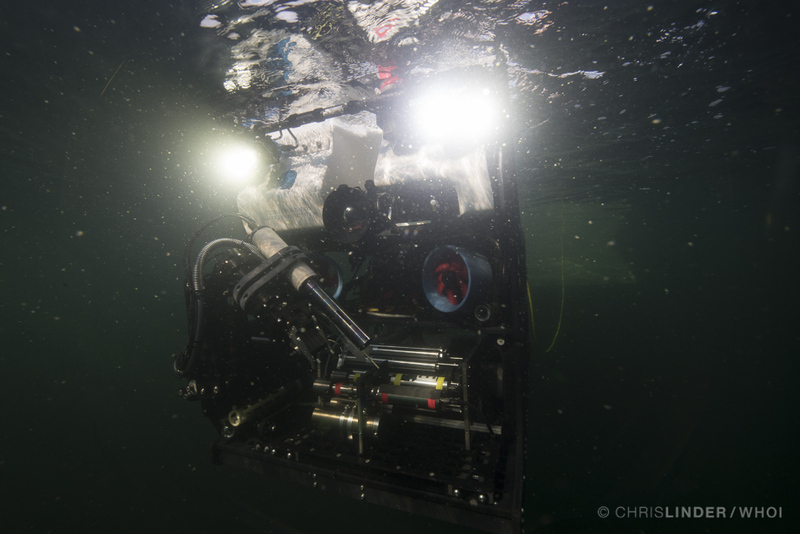 Read the captions to see how the HD-YLAKE team uses Yogi in Yellowstone Lake.